In this section we will discuss the two aspects of timing, the actual duration of a session using a pulsed magnetic therapy device AND the idea of human biorhythm and getting the proper frequency for the time of day. Let's start by discussing the duration of a pulsed magnetic therapy session. It's important to realize that more is not better and most of the leading German companies (leaders in this field) recommend just 8 minutes twice daily for maintenance. Again using the Earth based frequencies at the proper intensities, a little bit goes a long way. Magnetic pulse therapy acts like a whole body battery recharger, charging the voltage and energizing your cells.But just like a battery charger, when the batteries are charged, there is no need to continue charging them. 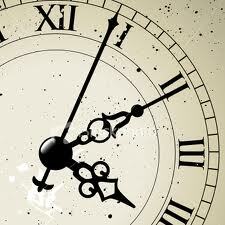 It has been found that 8 minutes two times daily keeps the cells charged for a normal healthy person. If someone has a health challenge, extra time can be added especially with local applicators. 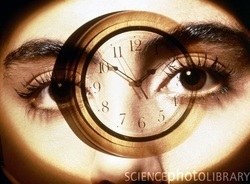 When considering the timing of biological rhythms, the concept of entrainment is important. Physicists use this term to describe a situation in which two rhythms that have nearly the same frequency become coupled (or connected) to each other so that both end up with the same rhythm. For example, a number of pendulum clocks mounted on the same wall will eventually entrain, so that all the pendulums swing in perfect synchrony. For this to happen the pendulums must have about the same period. What couples the pendulums are vibrations transmitted through the wall. Also, tuning forms that have the same resonant frequency become entrained if just one is struck. Also there have been studies with female roommates showing their menstrual cycles become synchronized over time. What we want to look at is the entrainment between our bodies and the environment. There is a lot of research on circadian rhythms and biorhythms of the human body and a lot of it is coordinated with the cycles of light and darkness and the release of melatonin from the pineal gland. Indeed there is a biological entrainment that takes place based on daily cycles of light and darkness. Circadian rhythms can also be influenced by other factors such as surrounding temperature, meal times, stress levels, exercise and other daily routines. Another example is the menstrual cycle being connected to the phases of the moon. So both the sun and moon have an influence on human biorhythm. But perhaps even more important is the frequencies of the earth and how intimately they are tied to our brain states, nervous system and internal clocks. Brain waves are not constant in frequency, but vary from moment to moment. The pacemaker or rhythm section is located deep in the brain, in the thalamus. It turns out that our core biorhythm related to the brain waves, has both an internal and external stimulus both alternating. Internally, the thalamus regulates the brainwave frequencies in cycles that last 1.5 to 28 seconds which trigger and entrain the entrain the entire brain. Eventually this ceases because of excess calcium buildup due to the stimulation of the thalamus. Then a "silent phase" lasting up to 25 seconds takes place where there is NO internal rhythm. This is called the "free run" phase and brain waves are entrained by the surroundings (specifically Schumann waves). Once the thalamus cells restore their calcium levels, the thalamic oscillation begin again. So the common brain state frequencies from low delta to high beta have both an internal and external mechanism and both are essential to keep the biological rhythms harmonious. 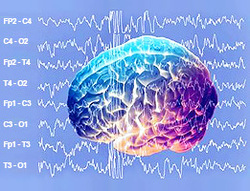 Brainwaves are typically recorded from an EEG (electroencephalograph) using electrodes on the scalp. The frequency of the brainwaves is constantly changing. 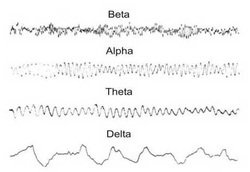 Delta activity (1/3 - 4 Hz) occurs during deep sleep and some brain disorders. Theta activity (4 - 7 Hz) occurs during various stages of sleep and during emotional stresses such as disappointment and frustration. Alpha brainwaves (8 - 12 Hz) have been associated with relaxation and also a normal healthy state of mind. Beta brainwaves (13 -30 Hz) are associated with heavy mental activity, stress and tension. Typically you are in this state when you are really busy at work. So What Should We Look for in a Pulsed Electromagnetic Therapy Device? When considering timing, most pulsed magnetic therapy devices allow you to program the time, but not many have a built in biorhythm clock. Look for a device that gives you the proper frequency for the time of day. For example, in the morning, you probably want to be awake and alert so a Beta frequency would be appropriate whereas before bedtime you will probably want a theta-delta frequency. We can use pulsed magnetic fields to entrain the brain to the proper frequency for the time of day, so make sure you find a device that offers this.